Don't worry if you accidentally sent a friend request on Facebook, or changed your mind after the fact: unless the other party has already accepted or rejected (ignored) your friend request, you will be able to cancel it, or "unrequest that friend": this doesn't unsend the pending friend request, but it deletes it. There are two ways you can unrequest a friend on Facebook: a fast way, which doesn't always work, and a slower way, which always works even with the new Facebook. We'll start with the bulletproof way to cancel a friend request. 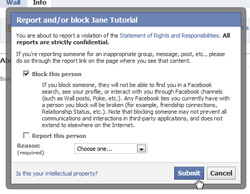 Facebook will confirm that this person has been blocked: if you want to let this person contact you in the future, click on the "Privacy" link to unblock this potential friend. Now that the person is blocked, the friend request has been canceled, or unsent; and remains canceled even if you unblocked this Facebook user. You can easily check that the friend request was deleted by going to this person's profile: instead of the standard "Awaiting friend confirmation" message you see during a pending friend request, you will see the original "Add as Friend" button. Behind the scenes explanation: temporarily or permanently blocking a user will cancel pending friend requests ("friend suggestion") you sent, because you cannot add as Facebook friend a user you blocked. If you get to this point, the other person should never see your friend request (and not know about your unrequest of the friend suggestion either). Either way you chose, we hope that you were able to cancel that request before the potential friend found it, and successfully unrequested your Facebook friend request!